When we moved here we have no idea how incredibly infested this farm infact the whole town is with fruit fly. The numbers here are unbelievable. It is heart breaking throwing out more than half the fruit due to infestation. I hate it, I really really hate it. We moved in during peak fruit and therefore peak fruit fly season. It was too late to do anything so it all went to the bin. This year we knew we have to do something. Having a handful of different types of trees makes commercial sprays tricky as different trees need different poison. 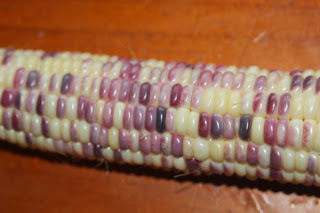 We are also not particularly keen on using those chemicals on our farm. The alternative, organic sprays, baits, traps and bags. We researched, we read, we discussed and came up with our action plan. This needs to be applied weekly, and reapplied again if it rains. It attracts both male and female fruit flies and poisons them. It is sprayed on the trunks of the trees. 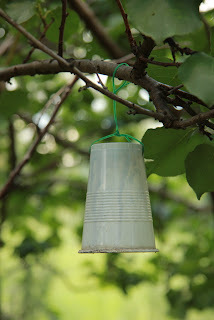 We instead decided to sray it into cups hanging in the trees so rain would not wash it away and apply twice a week. Verdict: Trees with two cups hanging were completely lost to the fruit fly every single fruit gone. Are these cups the cause? are they attracting the fly to the tree but not to the cup? Is the poison too dry to kill them instead the just act as a lure? Next year I plan on putting some disks of felt into the cups so the lure can be soaked in and dried out slower. These are designed to attract the males and kill them in trap. 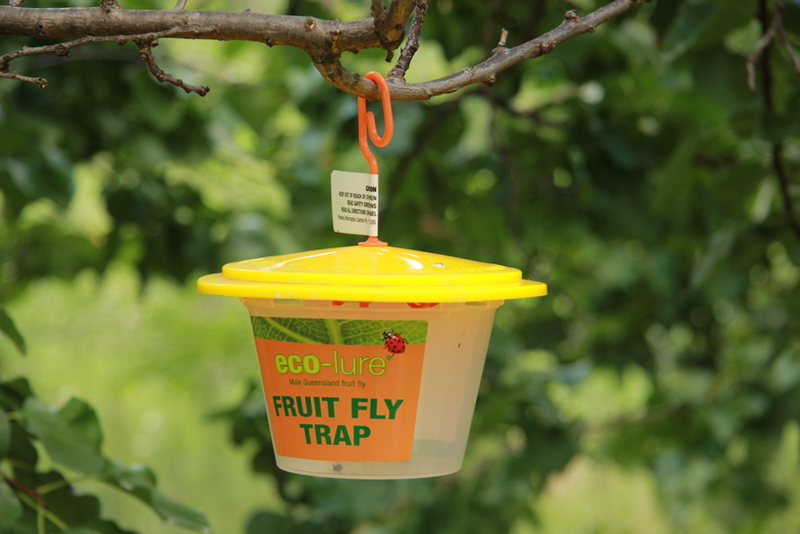 It is suppose to help give and indication of how infested you are with fruit fly. 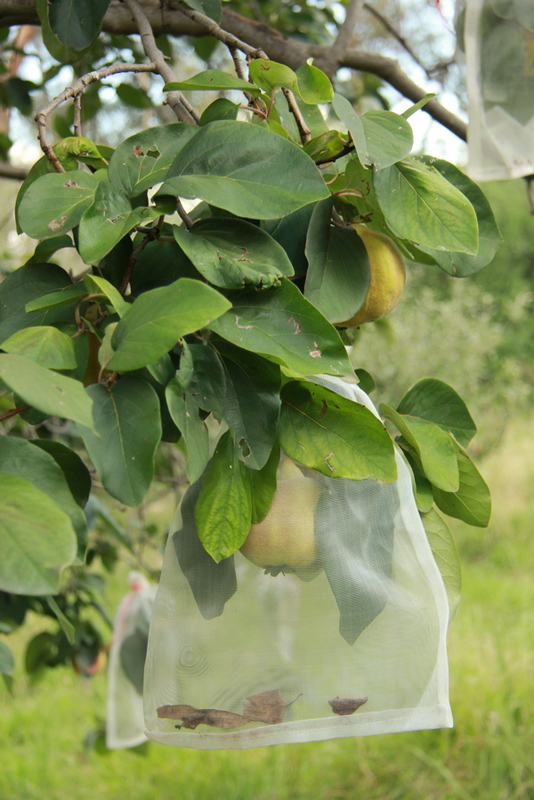 Verdict: Very very few flies in these traps but very large numbers of fly maggots in the fruit. Are they worth the money I do not know. Place them over the fruit tie them off and keep the nasty little critters out. Verdict: They work wonderfully. The fruit is free from the fruit fly maggots. 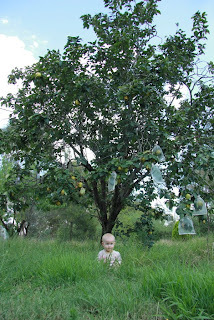 Keeps most of the fruit safe from birds and fruit bats. 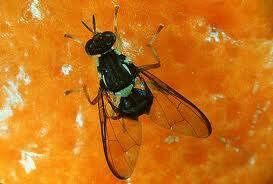 Fruit fly pupates in the soil, once they hatch it takes 24hrs for their wings to be dry enough to fly. Having chooks and ducks free ranging under the trees should mean a significant amount of fruit fly eaten. Verdict: We have a couple of acres for them to roam, 200+ trees and not enough poultry to make a great deal of impact. We are sure they helped to what degree is particularly hard to assess. Where to from here? Have a bit of a cry, a little more of a cry then try and come up with a new plan. Do we use commercial sprays next year? Maybe. Will the fly just be blown in from elsewhere? Most likely. Will we ever beat the fruit fly? Do we pack up and move? Yes. But we cannot, we cannot afford to move only 12months after moving in and Damo having not had a full time job for almost 3 years. This move has turned out to be one giant massive expensive mistake for many many reasons, the fruit fly being just one. For now we must knuckle down, bear with it, and turn this farm into the most productive farm we can, try and make improvements where we can so when we sell the place will sell quickly.